Texas Rangers' South Korean hitter Choo Shin-soo now has the most home runs among Asian players in Major League Baseball history. 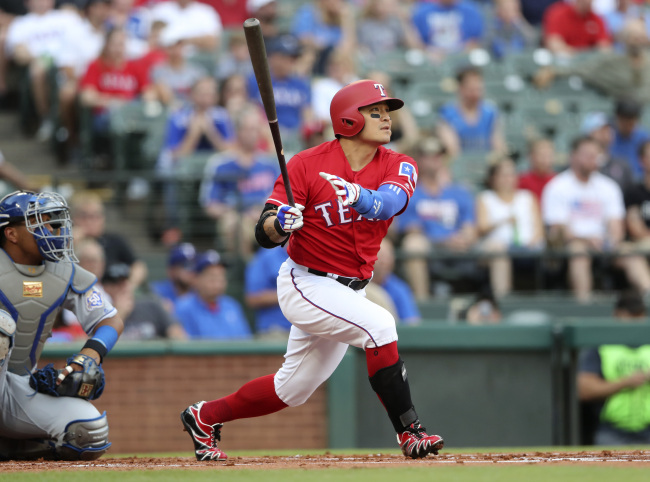 Choo made history with a walk-off home run in the bottom of the 10th inning against the Kansas City Royals at Globe Life Park in Arlington, Texas, on Saturday (local time), lifting the Rangers to a 4-3 victory. Choo has now hit 176 career home runs, one ahead of former New York Yankees star Hideki Matsui for most long balls by a player from Asia. Choo launched that opposite-field solo shot -- his third career walk-off blast -- off Kevin McCarthy, who'd retired the side in order in the bottom of the ninth and had sat down 15 consecutive batters over his five previous innings. It was Choo's only hit of the game in four at-bats. The 35-year-old also drew a walk and is now batting .259 with eight home runs and 23 RBIs. Choo, a pitcher signed out of high school by the Seattle Mariners, made his big league debut with the M's in 2005. He went on to play for the Cleveland Indians and the Cincinnati Reds before signing with the Rangers before the 2014 season.